Shakespeare told us that “the course of true love never did run smooth.” That sentiment is certainly true in productions born from the collaboration between director Michael Kahn and playwright David Ives. In anticipation of The School for Lies, we look back on the romantic farces produced by this duo. 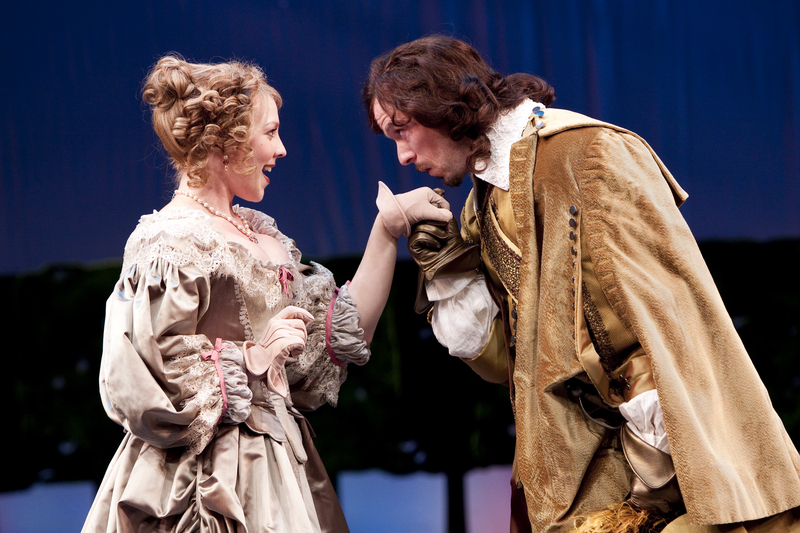 Erin Partin as Clarice and Christian Conn as Dorante in The Liar. Photo by Scott Suchman. Based on Pierre Corneille’s Le Menteur, The Liar follows the dashing Dorante as he courts Lucrece, thinking she’s Clarice. Seemingly thwarted by his father, Dorante proceeds to build a series of increasingly ludicrous lies. Grown from STC’s ReDiscovery series, The Liar worked in conjunction with other productions like Cyrano (2004), Lorenzaccio (2005) and The Silent Woman (2003) to give voices to great classical writers who are rarely performed. 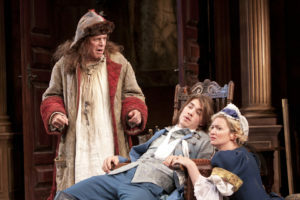 The highly successful production went on to be staged across the country and was revived just this winter Off-Broadway at the Classic Stage Company. 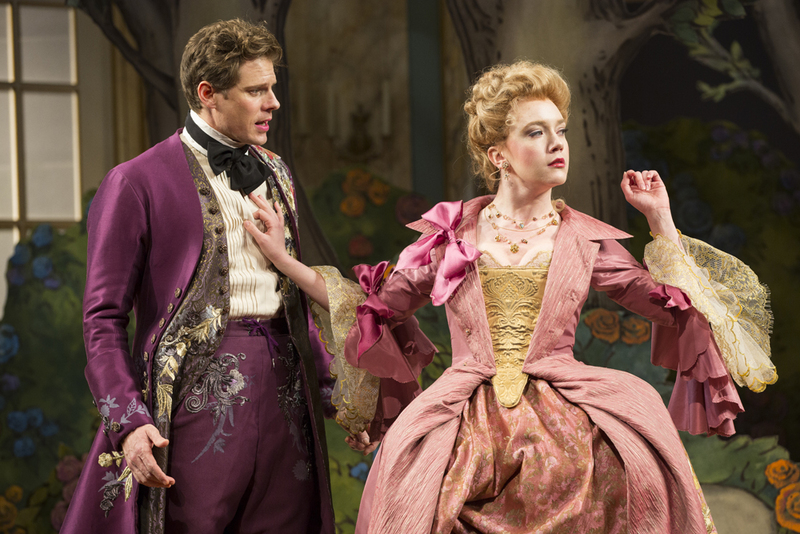 Floyd King as Geronte, Andrew Veenstra as Eraste and Kelly Hutchinson as Lisette in The Heir Apparent. Photo by Scott Suchman. This time drawing from Jean-François Regnard’s farce La Légataire Universel, The Heir Apparent tells of another young man seeking the means to marry his beloved. Eraste must appeal to his rich and ailing uncle Geronte for funds as he tries to push up his engagement to the beautiful Isabelle. Launching STC’s 25th anniversary celebrations, this comedy brought Ives and Kahn together once more. Costume Designer Murell Horton and Scenic Designer Alexander Dodge also returned to STC for the production, which eventually went on to play Chicago and San Diego. 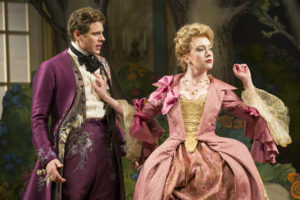 Anthony Roach as Dorante and Amelia Pedlow as Lucille in The Metromaniacs. Photo by Scott Suchman. Adapted from Alexis Piron’s La Métromaine, The Metromaniacs tackles writers and critics in equal measure. Young Damis is enamored with an elusive poetess, never guessing that the writer behind his favorite verses might not be who he believes. With this and their other collaborations, Ives and Kahn together expanded audiences’ understanding of traditional French comedies, proving them to be just as entertaining as Shakespeare’s comedies, and breathed life into the artistry of modern verse productions.